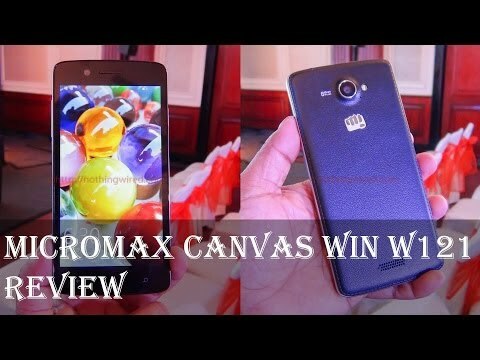 Latest price of Micromax Canvas Win W121 in India was fetched online from Flipkart, Amazon, Snapdeal, Shopclues and Tata Cliq. Micromax is looking to cement its position in the smartphone market for a while now and the latest Micromax Canvas Win W121 might give it the much needed boost. It’s the complete package at a very competitive price. Make heads turn with its sleek leather back panel that makes a bold fashion statement. The smartphone is stylish, sleek and slim with most of the area dominated by its screen. Unfortunately, it is only available in the black colour. Lose yourself in the intricate detailing of every visual that is displayed on its 12.7 cm HD IPS touchscreen. Enjoy sparkling clarity when you watch videos in high definition on its 1280x720 pixel resolution screen. Enjoy a world of life like colour quality with 293.7 pixels per inch colour depth. With social networking sites like Instagram and Facebook becoming increasingly popular, it is essential to have a good phone camera to capture candid moments and interesting selfies. The Micromax Canvas offers you an 8MP Auto Focus rear camera and 2 MP FF front camera. Get the best lighting for all your pictures with the LED flash and say goodbye to dull and unclear photos. A constant source of fuel to your phone is the 1.2 GHz Qualcomm Snapdragon 200 Quad Core processor which powers your phone without eating up your battery life. For most gamers this phone provides a dreamy experience with the combination of the 1.2 GHz Qualcomm Snapdragon 200 Quad Core processor and the high definition visual experience. Smooth navigation and seamless multi-tasking is made possible on the Canvas Win as you switch between numerous apps. Canvas Win has 8GB of internal memory which is expandable up to 32 GB. It is just enough to store all your videos, apps, games and pictures. You can enjoy entertainment on the move when you take your phone along wherever you go. Heavy apps often leave you with a drained out battery even before the day ends but you won’t face that problem with the Micromax Canvas which is powered by 2000 mAh long lasting battery. Now you can easily surf the net while you are stuck in traffic, listen to music, watch your favourite videos and enjoy non-stop gaming for hours without having to re-charge your phone so often. With around 8 hours of talk time and almost 150 hours of standby time, you won’t have to put a stop to your entertainment. The Micromax Canvas has decent call quality on both ends. It even has a stable signal even in low network areas. Long battery life, easy navigation, multi-tasking experience, camera quality, high definition and sleek design are just few of the reasons we love the Micromax Canvas Win W121. Be ready to fall in love with this power house of entertainment.